Sea Eagle is taking your racing to the next level with the New Sea Eagle NeedleNose™ 126 Racer Paddleboard. At only 26" wide x 12'6" long x 6" thick and 3 lbs. lighter than it's sister the NN126. This board is a faster, sleeker, lighter, high-performance racing iSUP. Featuring a universal fin-box with removable high-performance racing fin, Full-Length Electric Pattern Diamond Deck EVA Foam Pad - for the rigorous demands of racing, non-slip and sure footing, plus an extremely convenient built-in paddle saving PaddlePocket™ - so you'll never have to worry about losing your paddle while charging through the surf or during transport. This is hands down the world's best racing iSUP! 1st Gear: Most stable position, great for beginners, nice and easy pace. 2nd Gear: Lowers the NeedleNose™ bow, increases planning surface area, increases speed. 3rd Gear: Optimizes speed performance, fully engages NeedleNose™, NeedleNose™ slices through the water decreasing hull resistance while enabling straight and true tracking, full waterline length being utilized for speed, paddle stroke kinesiology being optimized for speed and efficiency. Customize Your Skill and Performance Levels with 1st, 2nd and 3rd Gear and maximum foot comfort and grip during. The diamond surface deck pad displaces pounds per square inch of pressure evenly along the pads of your feet while introducing air voids. Think it as standing on the clouds. 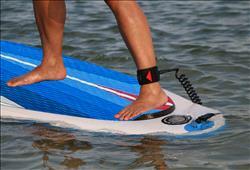 This allows you to paddle longer, further and faster without suffering from achy feet. Enabling you to easily perform advanced maneuvers such as sharp, snappy kick turns and 360º (turn on a dime) pivot turns while preventing you from slipping off the tail and assisting you with blind foot placement that's precise every time. Our Drop Stitch material uses thousands of high tensile strength threads connecting the top and bottom fabric layers, creating thousands of I-beam supports. This enables our NeedleNose™ Series SUPs to be inflated to a much higher pressure (15 psi) which increases overall rigidity while maintaining our SUPs incredible light weight. The unique Drop Stitch construction provides the added benefit of being able to be pack in its own backpack. 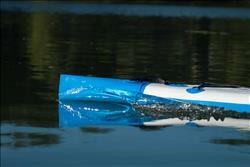 The Sea Eagle NeedleNose™ SUP is tough as nails, incredibly rigid, ultra light, and a delight to paddle. The NeedleNose™ Racer features a universal U.S. fin-box system. Although a great all-around racing skeg is provided, the U.S. fin-box system gives the rider the option to use different style skegs for various racing conditions and environments. *Be sure to check skegs for U.S. fin-box compatibility. Special price to the end of this month.